We have been busy busy over the past few months getting this project off the ground and am very excited about it. Circle Jerk is an acousmatic sound instillation that facilitates sound artists and musicians instinctual creation in the form or workshop, exhibition and performance. French engineer and composer Pierre Schaeffer of Groupe de Recherche Musicale(GRM) first used the term acousmatic to describe how the loudspeaker is like a veil that hides the source of the sound. An acousmatic performance plays and manipulates the concept of this veil through performatively mixing with the sonic character through multiple loudspeakers. The event will invite established sound artists to develop and present sound works through the use of a world class acousmatic system. 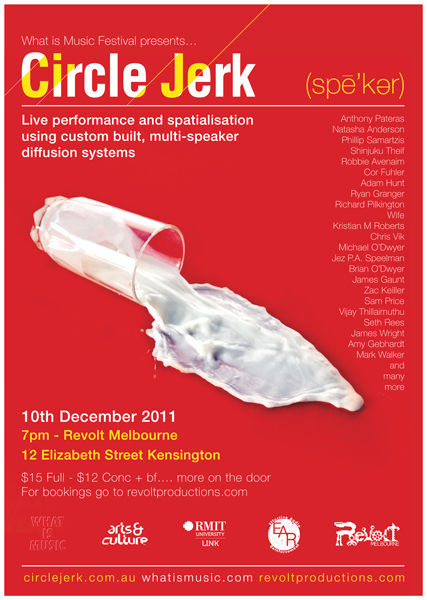 Circle Jerk will take place at Revolt Melbourne on December 10th 2011. The space will first be transformed through the installation of the lighting, video projection and two custom diffusion systems utlising more than 100 loudspeakers. The installation will creatively respond to the venues acoustic properties and aesthetics to achieve a unique playback system. The established facilities will act as a catalyst for the development of unique sound and musical works through a schedule of week long workshops and allocated sessions with the system. Through this time the collective will explore spatialisation as a compositional device with each artist composing a site specific performative work. At weeks end these compositions will be programmed into a night of performances and installations. Curators Adam Hunt and Ryan Granger will question the qualities and potency of the multi-channel works through the juxtaposing them against a collection of 2-channel and acoustic performances by other Melbourne artists and musicians encaptsualting genres such as Music Concrete, Electroacoustic, Noise & Electronic Music. Circle Jerk will congregate audiences from several sound art communities throughout Melbourne including Liquid Architecture, Make It Up Club, Hand Made Music Festival, Sibattical, an many more. This will provide an outlet for audiences to hear new works and genres whilst celebrating and enriching Melbournes sound art community. This entry was posted in Music and tagged What is Music? Ryan Granger. Bookmark the permalink.